All the books are published by Stabenfeldt. This ‘series’ is made up of a number of stand-alone pony stories with different characters and situations all linked by the presence of one character – Angelica the horse ‘angel.’ Angelica is an otherworldly girl who is some sort of guardian of the equine race. She has strange powers, including being able to communicate with horses, and know when they need her help. 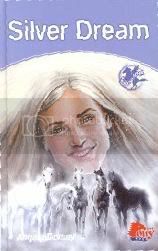 In the various books in the series she appears to help not only equines, but the central human characters in the stories. The books do not need to be read in any particular order. Before I read any of these books I thought the central premise of the series and some of the plot lines sounded a bit over melodramatic, and they probably could have been in the wrong hands. However when I read the first one in the series, as with a lot of the Stabenfeldt books, I was pleasantly surprised, and soon went on to read quite a few more. Not only was the idea of the horse angel/guardian handled far better than I expected, but, although many of the books in the series are adventure types stories, which normally I don’t care much for, these were all excellent. Angela Dorsey is without doubt one of the best of the authors writing for Stabenfeldt and her skill sets these books far above the usual pony adventure fodder. Although the character of Angelica is not explored deeply (seeming to be there mainly as a pivot for the plots), those of the other central characters in the books are. We really get an insight into their hopes and fears. The books actually contain real depth and although they may appear on the surface to be just supernatural adventures, each one is linked to an important real life situation or emotion, which balances out the supernatural element. For instance, one book explores the issue of senile dementia, another that of adoption. The heroines in each book often also have to overcome emotional issues or make tough decisions. For example in one book a girl must decide whether to condemn a number of wild horses to death in order to save a precious few. Another girl lives with the guilt of suspecting her father has committed murder. As with all good stories, the protagonists grow and change throughout the books as they come to terms with their feelings and resolve their problems, usually through their own efforts, as well as with the help of Angelica. The fact that Angelica does not just appear as a simple deux-ex-machina to miraculously save the situation, but also needs the reciprocal help of the human characters, makes the stories far more appealing. An interesting touch is the narrative style in which there are three separate viewpoints of the heroine, the ‘villain’ and Angelica. This is handled well and does not become confusing due to each viewpoint having separate chapters. It gives a balanced feel to the books and also explains to some extent how Angelica comes to appear in each scenario. There is also an interesting array of ‘baddies’ with one or two real nasties; but in other cases the bad guy’s actions are the result of their own emotional traumas, which in some books are resolved, enabling them to redeem themselves. Yet despite the fact the author manages to bring a depth of character and situation into the books, this does not at all result in dull stodge. She still manages to make the adventures or mysteries exciting and fast paced. Most of the books are real page-turners. The horsy content is good and varied. There are many different horsy situations from competitive riding to ranches to racing, and a number of different breeds appear too. Another point of interest is the wide range of settings for the stories, which include the USA, England, Ireland, South America and even Egypt! There is certainly enough to keep the attention of the most easily-bored reader. What Angela Dorsey has done in this series is to create books which have something for everyone. Those who like adventures, excitement and danger will love them, and those who like a little bit of depth and character development to sink their teeth into, will also get a lot out of them. Fans of both the supernatural and realistic plot will also enjoy the stories equally. In this way I think they appeal to a wide range of readers and also a wide age range. I have not read all the books in the series, but for those I have read I would award 4 - 5 horseshoes. Excellent review! I have recommended Dorsey's books so many times on other forums. Dorsey really does a great job of exploring emotional issues and "coming-of-age" dilemmas and the like without ever becoming preachy. The plots really MOVE along, too, which may be helpful in interesting some less-enthusiastic readers. Dorsey is definitely one of Stabenfeldt's best authors. Love the many international settings, too, with some good (if basic) information about different cultures. I also really like that all of these books are about simply loving horses as horses -- they are not about winning the big race or a first in the showjumping class or whatever. I love those competition-focused stories, too, absolutely I do, but Dorsey's books emphasize friendship and values and being caring and honoring commitments and making difficult decisions and understanding both the good and the bad in people -- but the stories never become dull or bombastic, as you said.